Daily Life Takes HOW Much Water? 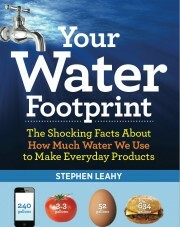 The concept of such “hidden water” may seem unfamiliar to some, but it’s an important part of our impact on the planet, argues author Stephen Leahy in the recent book Your Water Footprint: The Shocking Facts About How Much Water We Use to Make Everyday Products. 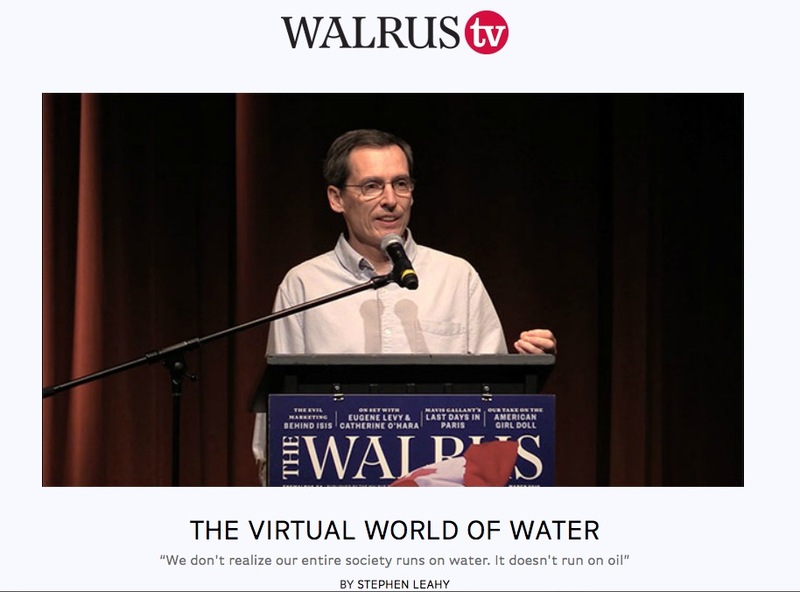 Leahy, who has written for National Geographic, spoke with Water Currents about how water is required for almost everything we do, and how we can reduce that impact. What inspired you to write a book on hidden water? When I was in Australia doing a piece on climate change and invasive species for National Geographic I took an extra week of vacation and hung out with some Aborigines in a remote part of Queensland. To get water I had to walk 200 yards to a stream. It was heavy to haul the water and when it got dark it felt risky because they have nasty snakes and spiders there. That made me appreciate water more. Then I went to a sacred waterfall, where shamans are initiated. In one of the final stages a candidate grabs the biggest rock they can lift and jumps into the pool, where they lay down until they drown. If the spirit finds them worthy they are brought back alive and become an official shaman. It had been over 20 years since someone managed that, but hearing about it made me realize that these folks take water really seriously. And then when I got home from that trip I saw an email from the publisher, Firefly, asking if I wanted to write a book about hidden water. I thought it sounded like a really interesting approach to an important subject. What aspect of hidden water most surprised you? I was surprised by just how much water it takes to make everything. We don’t really have any material things without water, from food to housing, furniture, electricity, transportation, and so much more. I tried hard to find something that doesn’t need any water and I couldn’t, which showed how dependent we are on it. And yet we pay little attention to it. We have a lot of stubstites for oil, but we don’t have any water substitutes. In your book you note that it takes eight bathtubs of water for a typical breakfast. So what should people do if they want to reduce that? The easiest way to reduce the amount of water you consume is to cut back on meat, since raising meat is really water intensive. Beyond that, beef is much more water intensive than chicken, so you can substitute one for the other. Next, if you can buy local food it’s easier to find out about how it was produced, including if the water used was managed sustainably. That’s important because it’s not just the amount of water that’s important, it’s also how it is managed. For example, is excess water returned to the local system? Farming many water-intensive foods in a desert or semi-desert is not sustainable. California, for example, has a huge water deficit. It’s also true that about 40% of all food in North America is wasted, which means a huge amount of water is wasted. So reducing food waste can really reduce the amount of water you are using, way more than a low-flow shower head, which is still important. What else can people do to save water? A lot of it is going back to the basics on reducing and reusing stuff. Reduce the number of times you swap our your cell phone for the latest model and you’ll save 240 gallons of water. Find a home for your phone if you really have to have a new one instead of tossing it in the landfill. Consumption of material goods means consumption of water. Flat screen TVs are also very water intensive, requiring tens of thousands of gallons for each one. So ask yourself if you really need it. Use thrift stores to get your clothes, which are fortunately cool again. In your book you write that “peak water” is already here and yet few people know it. Can you explain what that means? The amount of freshwater that’s available is limited, it’s a tiny fraction of all the water there is on the planet. But our demand is soaring. We’re growing in numbers and in our consumption of things, and each and everything requires water, and lots of it. The Ogallala Aquifer [in the Great Plains] is declining about nine feet a year and within 20 years or so it’s going to be empty. It’s the same problem in California. Three in five people in the world will be experiencing water scarcity by 2025. At Davos world leaders recently said that the biggest challenge humanity faces in the next 10 years is water scarcity. 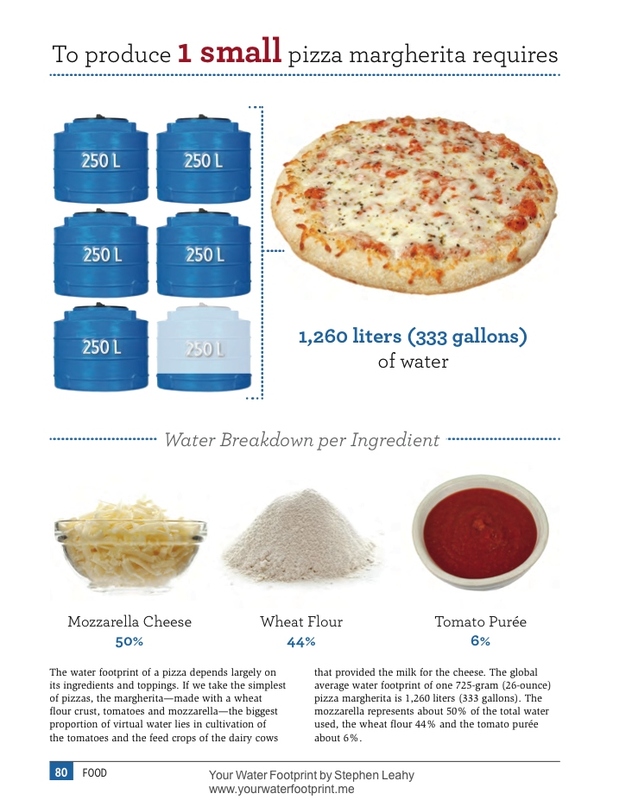 We’ve covered hidden water at National Geographic before (and in our water footprint calculator) and people often tell us they struggle to understand the concept. They think of water as what comes out of their tap. Do you think it’s a hard message to get across? It’s a hard message for adults but apparently not so hard for kids, who seem to grasp it right away. Our new book has a lot of infographics that try to break it down to help people understand it. We try to show, for example, that a car is like a giant bag of water, with another bag of water on top of that for fuel. Clothes are bags of water, so are books. There also seems to be a widening gap between many people around the world who don’t have clean water and those of us who seem to be using more and more. How can this gap be bridged? Ginormous rivers of virtual water are flowing from one country to another. A lot of it isn’t very smart. For example, Egypt is a big exporter of oranges, mostly to Europe. But it’s a desert country. It takes roughly 20 gallons of water for each orange, but at the same time they don’t have enough water to grow the food they need. So they end up importing cheap food from other countries. Australia is the biggest virtual exporter of water, through mining and agricultural products, but it’s also the driest continent, so that doesn’t make sense. Don’t use more water than you have. If you can grow crops that can be rain fed, that don’t require irrigation, that’s great. If it requires adding water drip irrigation is far more efficient than flood irrigation. Stop and think before you do something if you really need it or if there is another way to get the service. Can you get those jeans at a thrift store? Can you take a train instead of drive [which saves on the amount of water needed for fuels]? Can you get your cell phone used?